A sharply honest and moving debut perfect for fans of The Perks of Being a Wallflower and Ask the Passengers. Riley Cavanaugh is many things: Punk rock. Snarky. Rebellious. And gender fluid. Some days Riley identifies as a boy, and others as a girl. But Riley isn't exactly out yet. And between starting a new school and having a congressman father running for reelection in über-conservative Orange County, the pressure—media and otherwise—is building up in Riley's life. On the advice of a therapist, Riley starts an anonymous blog to vent those pent-up feelings and tell the truth of what it's really like to be a gender fluid teenager. But just as Riley's starting to settle in at school—even developing feelings for a mysterious outcast—the blog goes viral, and an unnamed commenter discovers Riley's real identity, threatening exposure. And Riley must make a choice: walk away from what the blog has created—a lifeline, new friends, a cause to believe in—or stand up, come out, and risk everything. From debut author Jeff Garvin comes a powerful and uplifting portrait of a modern teen struggling with high school, relationships, and what it means to be human. Before becoming a writer, Jeff Garvin acted in films and TV and was the front man of a nationally touring rock band. He has a BFA in film from Chapman University and lives in Southern California, surrounded by adorable, shedding beasts. 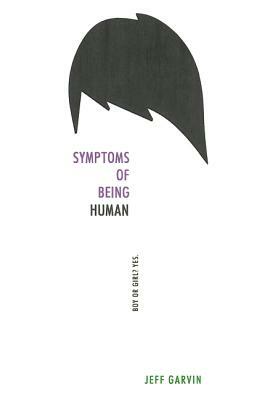 Symptoms of Being Human is his first novel.